Martin Gutoski thought he had it made. It was 1966, he'd just graduated high school in Fairbanks and his dad had secured him a summer job with Alaska's highway department. He thought it was a prime gig—he'd be making $2.75 an hour—assisting in surveying what would become the Teller Highway. He was excited about the job, but said he didn't really know what he was getting himself into. Back then, he said, his biggest influences were 1960s music and California fashion. So he flew from Fairbanks to Nome to start work wearing a pair of jeans, a "Beach Boys-style" shirt and a stout bowler cap that he'd soaked in water and put on the end of broomstick so it came to a point on top. "It was all the rage back then," Gutoski said. "I flew to Nome wearing that not knowing it would be colder and wetter in Nome than in Fairbanks." After the chief engineer picked him up from the airport, they drove to camp near the Tisuk River. There were no bridges to cross the river—that would be part of their job—so they had to ford it. "I thought, 'Oh man, is this really how I have to get to work?'" Gutoski said. Because there weren't phone lines connecting Fairbanks to Nome yet, he had to write his parents to send him more appropriate wet-weather gear. Camp life wasn't what he'd expected either. He described his co-workers as "hardened laborers," their plywood lodgings as "gypsy caravans" with two bunk beds each, and recalled that the mosquitoes were hungry regardless of the temperature. "I was kind of a joke in the camp," Gutoski said, laughing. "I'd go to the chow hall and they'd call me 'pinhead' because of my cap. Someone once filled my hat with coffee and put it back on my head, said 'Here, that'll keep you warm.'" He returned to Fairbanks for college at the end of the summer but would continue to do surveying until he officially retired from his job as a platting officer for the Fairbanks North Star Borough in July 2014. He maintains a small private practice for some extra pocket money. His nearly 50 years as a surveyor have given him a plethora of stories, especially about working on the Parks Highway. It was there he began to see the advancement of surveying equipment. "We had this track vehicle to take us to work sites," Gutoski said. "It was this big Swedish-made vehicle with wide rubber tracks that was designed for snowy slopes in the Alps and we were using it for driving in a swamp." Often if the driver turned too sharply or they broke through the top layer of vegetation over the marsh the track would be thrown and the crew would spend all day trying to wrangle the 24-foot-long rubber loop back on while standing in deep swamp water. Finally the Department of Transportation hired helicopters to transport crews to work sites. They weren't that much more efficient. The choppers could hold just 300 pounds at a time, so they would need to make multiple trips to haul crew and gear. "We called them 'flying Dixie cups,' but they looked just like the helicopters in 'M.A.S.H.,'" Gutoski said. "The interesting thing was the pilot was fresh out of Vietnam and was used to combat flying, so he'd never land. He'd hover, yell 'jump out,' spin 180 degrees and take off. He was nervous and it showed. You'd see him glancing around the woods for Viet Cong that might shoot him." With the arrival of higher quality equipment, he also saw crew sizes shrink. "It's funny, because way back when, the lowest people and the highest people on crew would complain about each other all day," Gutoski said. "Now it's just one guy out there. I suppose you could complain about the satellite, but it couldn't care less. Now that I'm retired, I get together with other retirees and we complain about how these young people now don't know anything about what we went through." Erin McKittrick sat shielded from the roaring wind in a tent at the base of the Shaler Mountains on Unalaska. Spread across the tent floor were a series of maps. She was trying to find a way over the mountain range. It needed to be a fairly quick route—they were low on supplies. And it needed to be safe—she and her husband had their 4- and 6-year-old children in tow. Their trip was already delayed due to strong headwinds along the southern coast that prohibited them from paddling their packraft, meaning they had to do a long hike instead of what was supposed to be a quick paddle. She had a big decision to make: cross a short pass on the northern side and row around the big headlands or opt for a sequence of passes to the south that would be more difficult but wouldn't require any paddling in the rough water. "I was looking at the maps and thinking, 'OK, how many days will each take and what happens if the weather goes bad and if it does, can we back out from one route to another?'" McKittrick said. Years of treks like this—she once hiked and paddled over 4,000 miles from Seattle to the end of the Aleutians—had taught her how to read the topographic lines on the map. They tell her how steep a climb will be, where there are likely cliffs and which routes are feasible. Ultimately, she chose the difficult passes that didn't depend on the weather. A smart move, she said, because the other way would have taken too long. McKittrick prints off thick stacks of maps before each expedition for instances such as that. The maps vary in breadth of coverage and ratio of miles per grid square, allowing her to chart new directions depending on whether she wants to look at a zoomed out expanse or at magnified minutiae. "The lines you draw when you are originally planning are a convenient fiction," McKittrick said. "You'll probably have to do something different when you're actually out there. It's good to be over prepared." The maps McKittrick uses now are a far cry from the ones that originally committed Alaska to paper. Explorers like Vitus Bering, George Vancouver and James Cook were tasked with charting the coastline. And because they were mapping from the decks of their ships, the accuracy left much to be desired. "It's hard to see from the boat the shape of the coastline, because the perspective is tricky," said Gennady Gienko, a UAA professor of engineering. "It was all an estimate of distance, so nothing was accurate." Those maps also lacked the necessary language: blue lines for rivers, black for roads, green swaths for vegetation and red for contour lines showing elevation. The U.S. Geological Survey helped add color to the maps. Their earliest presence in Alaska dates back to 1889, though it wasn't until after World War II that their topographic mapping efforts began to bear fruit. "They did the best with what they had at the time, but most of it was really bare bones," said Greg Durocher, a supervisor at USGS Science Information Services. Many of those early mapping expeditions were done using packhorses, sled dog teams and boats. Small crews were also known to backpack 35 plus miles one way through thick underbrush to reach a worksite, lugging heavy backpacks with food, a tent, axes, saws, rifles and other mapping equipment necessary for their expeditions. The first areas to be mapped were usually done for military purposes to find where the vegetation was thick enough for concealment. The next round of maps were mainly geological surveys and some topographical features. It wasn't until the late '40s and early '50s that photos shot from aircraft were used in map development. Those black and white photos were shot with handheld cameras from early-model helicopters that were essentially two seats, a set of wheels and a propeller. As more and more advanced tools were created, more of the state was mapped. The Bureau of Land Management office in Anchorage now holds a mini-museum of nearly 100 years of equipment, arranged in an order that ascends in time as it descends in the physical size of tools. "Now we're to the point where we are using satellite imagery, more advanced photos and radar," Gienko said. "Those technologies allow us to measure the surface in much greater detail." Currently, the Alaska Statewide Digital Mapping Initiative group, which consists of multiple agencies, is working on revamping Alaska's maps, making the early rudimentary maps look like Etch-a-Sketch doodles. "They're creating a very detailed map using aerial and satellite imagery," Gienko said. "Anchorage was surveyed in the summer of 2015. Very high resolution. You can see your car." 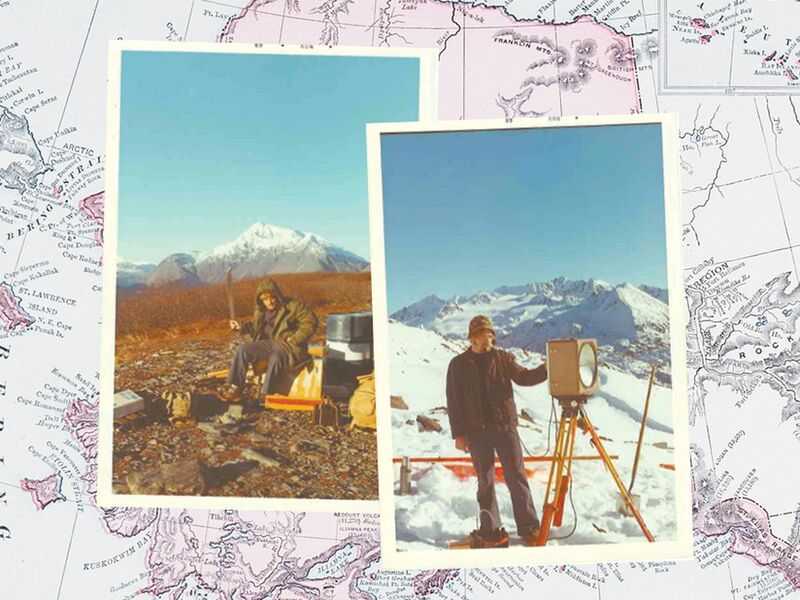 The advent of GPS has made for the most recent iteration of Alaska maps. Services like Google Maps and Mapquest have made it easier for travelers to get from Point A to Point B. The everywhereness of smartphones mean you can get, well, pretty close to everywhere provided you have cell service and a juiced-up battery. McKittrick said though she sees the benefits of the digital devices, she's going to continue to print out maps for her trips, because though the gadgets have gotten increasingly better, there are still plenty of places in Alaska where she can get off the (mobile provider) grid. Even the drive from Anchorage to Homer, a well-traveled scenic route, can be patchy in terms of cell coverage. "We always have paper maps on expeditions," McKittrick said. "The problem with digital maps is they only provide you with one route and sometimes that route doesn't work for some reason. You have to be able to figure out which way to go and what else is possible." Steven Claggett spends time hiking when not at his day job on Joint Base Elmendorf-Richardson or his evening gig at REI. He sells GPS devices at the outdoor outfitter but uses paper maps exclusively. For him, maps of the real ink-on-paper variety are imperative in Alaska's many remote locations where outlets are scant and the words "No Service" can lurk in the upper left corner of a smartphones. Granted, he has to laminate them. "If your map isn't tearproof and waterproof, it's toilet paper," he said. "Maps can't run out of batteries, the screen can't break and as long as you know how to use them, they're pretty reliable," he added. "It's like having a book versus having an e-reader. There's a different feeling to it, a different experience." Alaska Geographic, a nonprofit that partners with Alaska's parks, forests and refuges, sold 1,273 maps during 2015 from its downtown Anchorage location. 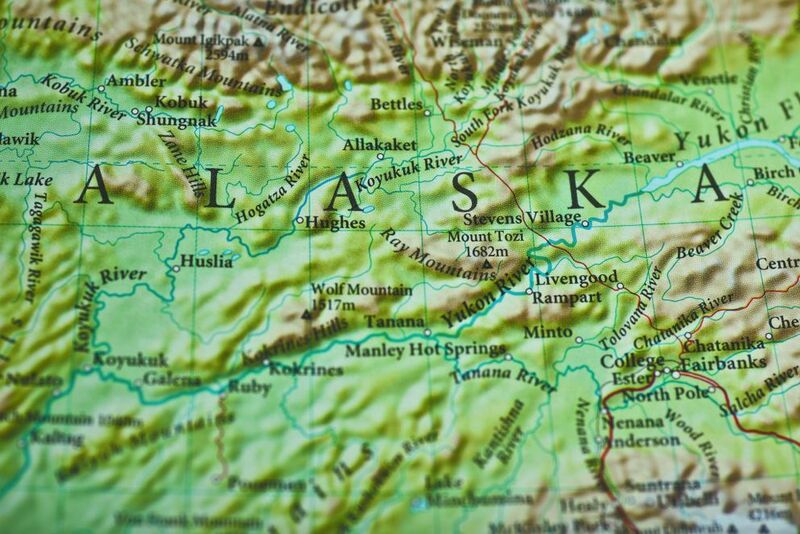 It's also the last place in Alaska where USGS maps are available for purchase—a big shift from just a few years ago when the USGS map store in Anchorage had 3,000 titles and over a million maps on its shelves. "There is still so much demand for maps by hunters, recreationists, miners, foresters and geologists," Durocher said. "I don't see that going away as long as they want to get out of town." Right now, the USGS emphasis is on digital map products and updates—they're easier and faster to update. Durocher doesn't see it as a competition, though. Just different sides of the same coin. "People may have their preference for which to use, but one thing holds true: All adventures start with maps." This story first appeared in the June 2016 Adventure Issue of 61°North. Contact the editor, Jamie Gonzales, at jgonzales@alaskadispatch.com.